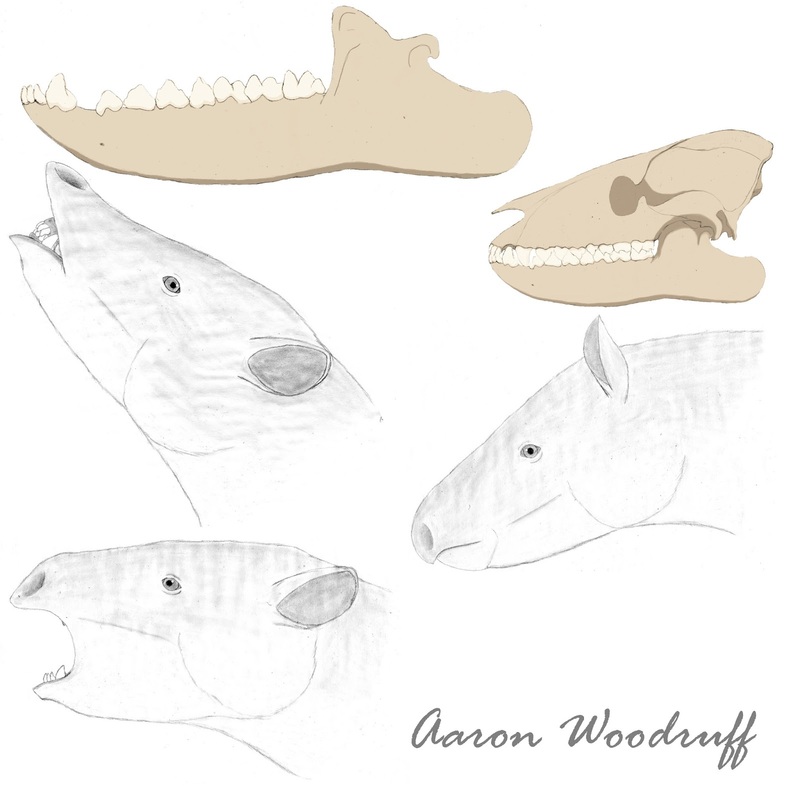 Anthracobunids (Anthracobunidae) are an extinct group of herbivorous mammals from the Eocene of southern Asia. These animals were formerly considered to be members of Tethytheria, the group of mammals which contains elephants, hyaxes, sirenians, and their relatives. However, a recent study in 2014 has shown that anthracobunids were actually basal members of Perissodactyla, related to tapirs, rhinos, and horses. Anthracobunids have a complete dentition of 44 teeth. The incisors were relatively small and simple, with relatively large canines. The cheek teeth were low-crowned with bunodont* or bilophodont* cusps, suggesting that these animals fed on relatively both soft to moderately hard, non-siliceous plant matter. 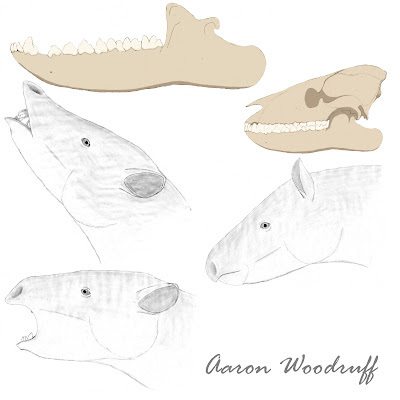 Based on tooth measurements, anthracobunids have been estimated to be about the size of modern tapirs, with body masses ranging from 100 to 275kg (220 to 610lbs). Unfortunately, complete skeletal remains are virtually unknown for this family. 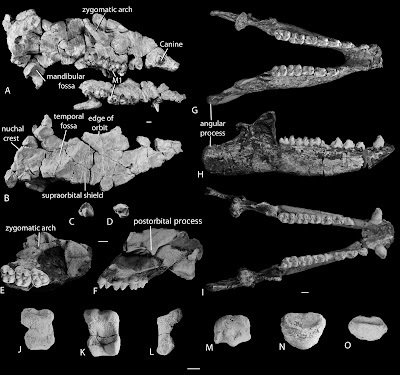 All described anthracobunid fossils are limited to skull and mandibular fragments, isolated teeth, and incomplete postcranial elements. A-B: the crushed skull of Anthracobune pinfoldi. C-D: second premolar of A. wardi. E-F: skull fragment of A. wardi. G-I: complete mandible of A. wardi. J-L: proximal phalanges of A. wardi. M: head of a metapodial from A. pinfoldi. N: phalangeal fragment of A. pinfoldi. O: terminal phalanx of A. pinfoldi. Stable isotope values and long bone geometry studies have suggested that anthracobunids fed on land and spent considerable amounts of time in water. The postcranial bones were hyperostotic, meaning that they were much denser and more compacted than those of most terrestrial mammals. This condition, which increases buoyancy, is an adaptation associated with aquatic or partly aquatic mammals which spend most of their time in shallow water such as hippopotami, early whales, tapirs, and rhinos. All evidence suggests that anthracobunids shared behavioral and ecological similarities with tapirs and certain species of rhino. These animals likely had relatively restricted home ranges which overlapped with a permanent source of freshwater such as a river or lake in which they would frequently wallow and wade. They would forage in the forested environments which bordered these water sources and would readily retreat to water to escape predation, for thermoregulation, relief from terrestrial parasites, or simply to rest. its ecology and behavior would have been similar to that of modern tapirs. As of 2014, the Anthracobunidae contains 3 genera with 4 species between them. 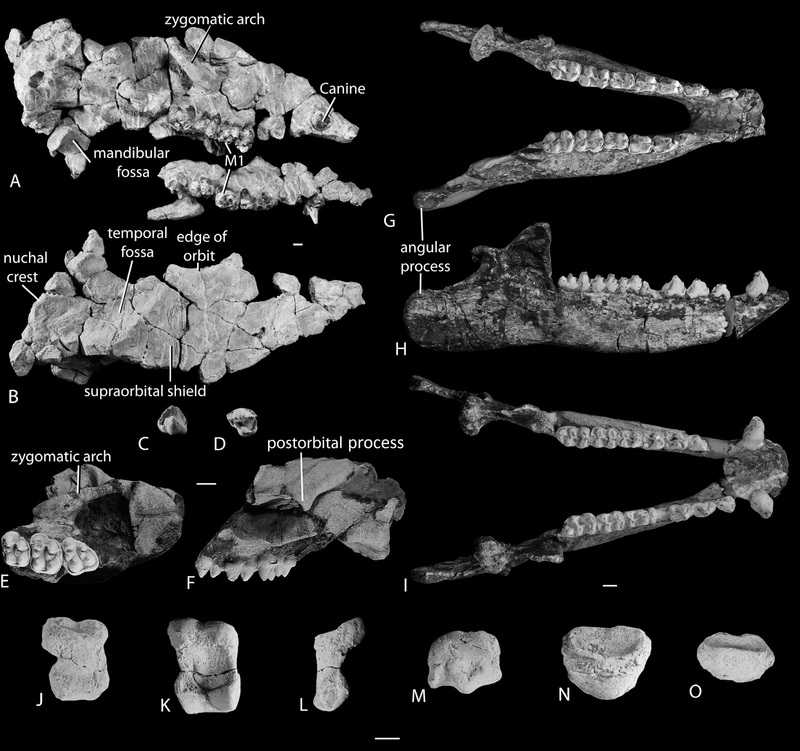 Two other monotypic genera, Ishatherium (I. sabathuensis) and Nakusia (N. shahrigensis), have been excluded from the family based on differences in dental morphology. The name Anthracobune is derived from the Greek anthrakos, meaning “coal”, and bune, meaning “mound”. Thus, the genus name translates into “coal mound”. Members of this genus lived during the middle Eocene of Pakistan. 2 species are known; A. wardi and A. pinfoldi. A. wardi, the type species of the family, was originally placed in Anthracobune by Pilgrim in 1940, only to be placed in the now defunct genus Lammidhania wardi by Gingerich in 1977. It was later moved back into Anthracobune 37 years later by Cooper et al. in 2014. Jozaria is represented by a single specimen belonging to the only known species of this genus (J. palustris). Geological evidence indicates that the animal inhabited a brackish marsh environment and it may have fed on the soft aquatic vegetation found there. Containing the singular species, Obergellia occidentalis, this animal from the middle Eocene of India and Pakistan is the most recently described member of the Anthracobunidae. Although its fossil remains were first discovered in 1980, the genus Obergellia was erected by Cooper et al. in 2014. The name honors the late married vertebrate paleontologists Friedlinde Obergfell and A. Rango Ral. It differs from other anthracobunids in a suite of dental and mandibular characters.